Ryan Lavarnway's tenure with the Boston Red Sox has come to a close. The Los Angeles Dodgers claimed Lavarnway after he was put on waivers to clear a roster spot for Pablo Sandoval. Lavarnway, once a promised prospect, never lived up to the hype. He was never able to hit for power with the Sox, a tool many thought was his greatest asset. His offensive production was sub-par and his poor defense never progressed. In 97 career games, Lavarnway has a .201 batting average, 5 homer runs, and 34 RBIs in his 279 at bats. He tried to learn 1st base to add to his versatility but ultimately, it did not make a difference. 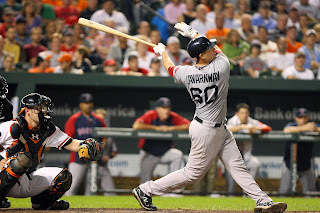 With either Blake Swihart or Christian Vazquez behind the plate for the foreseeable future and either Mike Napoli or Allen Craig at first, Lavarnway did not have a place on the team, even as a backup. Lavarnway had clearly fallen out of favor in Boston and now is certainly the right time to cut ties, hence the reason he was placed on waivers to being with. Ultimately, he was a failed prospect and a change of scenery could be good for his career. It just was not going to happen in Boston at this point. Thoughts on Ryan Lavarnway going to the Dodgers?